We hope everyone had a nice Thanksgiving weekend with family and friends. There is still time before the winter holidays arrive. While we are sure everyone is busy with shopping and preparation, don’t let this season’s opportunities pass you buy! Winter can be a great time to connect motivated buyers and sellers and The Zamir Group is here to help you navigate the market. This Sunday, December 4th we will be opening 3 different houses in Fair Lawn including a brand new listing and some gorgeous Radburn real estate. Stop by our new office on Fair Lawn ave afterwards and meet with our agents. There are incredible buys and great opportunities this time of year. Treat your family to the biggest gift of all! The seasons are changing and it is more important than ever to work with a qualified agent. The Zamir Group is the number one ranked realtors in Fair Lawn and #1 in all of Bergen County for Keller Williams…not to mention #1 in sales for the entire NJMLS 2016 YTD. We have closed hundreds of transactions over the last few years and know how to navigate difficult markets. We can help you buy, sell, rent or invest – and we have access to off-market and coming soon listings that other agents do not. Open houses are a terrific opportunity to meet and interview agents who can help you start or redirect your real estate journey today. 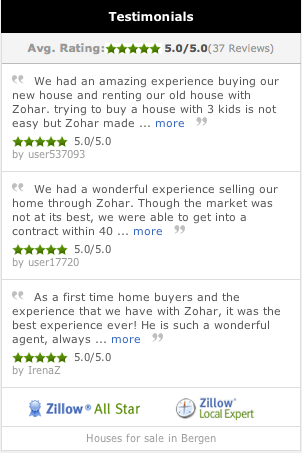 Meet with us for a complimentary consultation and put The Zamir Group to work for you today! This Sunday, December 4th we have 3 Open Houses in Fair Lawn. They will all take place from 2-4 PM. We feature a variety of home styles and price points, as well as a variety of agents. See one, see many and let us answer all your questions! 39-18 Knott Ter in Fair Lawn– $769,000 First Open House! 5-03 Bryant Pl in Fair Lawn– $349,000 Just Listed! Our group can’t wait to meet you! This many agents in this many houses opens up a lot of opportunities. Ron, Silvia, Michael, Tali and Zohar will be waiting!